Modern pickup trucks can have comforts and conveniences that rival some premium-brand cars. 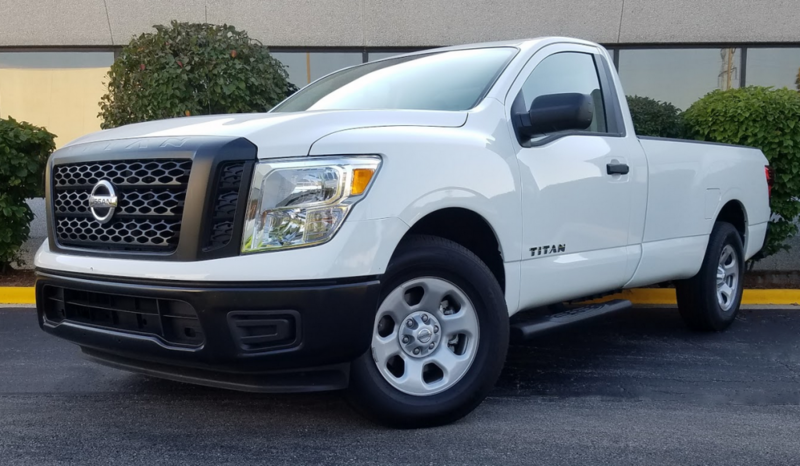 Take a top-line Platinum Reserve model from the redone 2017 Nissan Titan ½-ton lineup. You can get it with premium-leather upholstery, open-pore wood trim, heated and cooled seats, heated leather-wrapped steering wheel, dual-zone automatic climate control, voice-command navigation, satellite radio, 12-speaker audio, and so much more. 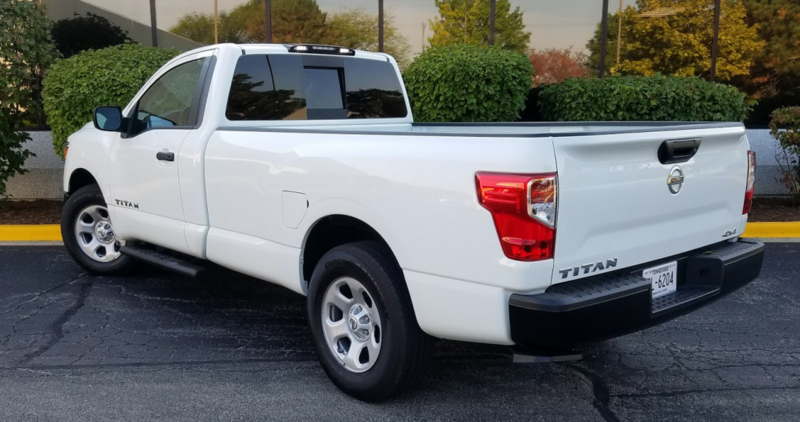 A Titan S in Glacier White is about as austere as a modern pickup truck gets, but our tester sported a couple handy dealer-installed add-ons–bodyside step rails and a retractable step that flips down from the driver’s side of the rear bumper. Or you could slide behind the wheel of a Titan S and just say to hell with all of that. Consumer Guide® editors did both of those things when they tried out a Glacier White regular-cab Titan S with four-wheel drive but bereft of factory-installed options. In this naked-as-the-day-it-was-born state, the entry-level S stickers at $33,805 with its $1195 delivery charge factored in—which is $3030 more than its rear-wheel-drive counterpart costs. The test truck did have a few dealer-installed add-ons: deep-channel all-season floor mats, step rails, and a retractable step that tucks under the left corner of the rear bumper when not in use. The Titan S’s cabin offers few frills, but the interior materials are sturdy and nicely assembled. The large center armrest offers a generously sized segmented storage bin, and the armrest also flips up for three-abreast seating–in a pinch. The Titan S delivers the essence of the pickup-truck experience for the hard-nosed budget-driven buyer—and in single-bench-seat regular-cab form, it provides the pickup experience as it used to be. Expect to see more of them in fleets than in suburban driveways. How stripped down is the Titan S? Bumpers, grille, door handles, and exterior-mirror bodies are all matte black. The mirrors themselves must be adjusted by hand. The 18-inch wheels are styled in steel and painted silver. Inside, hardy patterned-cloth inserts and vinyl trim cover the seats. The floor covering is vinyl to make cleaning easier. Still, it would be wrong to paint the S as utterly ascetic. Nissan does provide it with more than four wheels and an engine. Windows and locks are power operated. There’s remote keyless entry and push-button starting. The rear window slides open (manually) for ventilation, and an LED lamp atop the rear of the cab can illuminate the contents of the cargo bed. The removable tailgate includes a lock and a “dampener” to help the tailgate drop gently. 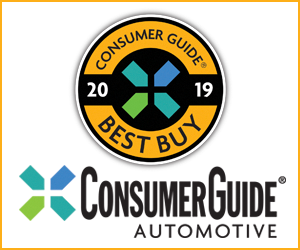 Other standard items are cruise control set by steering-wheel buttons, AM/FM/CD audio, manual air conditioning, NissanConnect with mobile apps, and Bluetooth-enabled phone and streaming-audio connectivity. 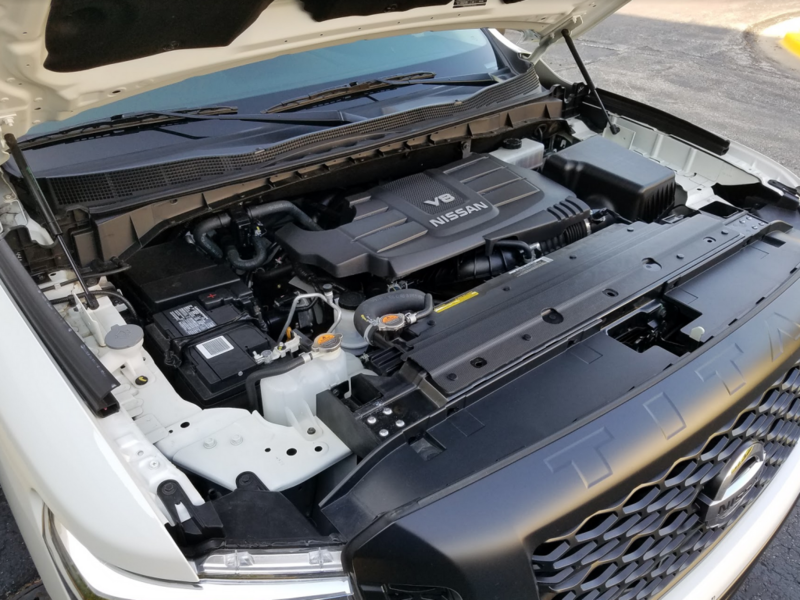 The Titan’s 390-horsepower 5.6-liter V8 supplies hearty acceleration. The test vehicle exemplifies the changes being made to the Titan line as the 2017 model year unfolds. The close-coupled single cab design, the first of its kind in the Titan clan, is an addition that was made after the ’17s hit the market. Crew cab and extended King Cab configurations are available too. 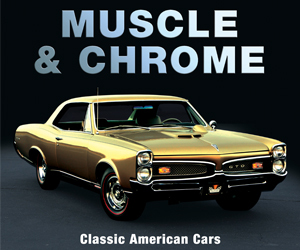 However, the 5.6-liter V8 was the only engine available at the start of production. A V6 was to join it later. With no abundance of roof pillars or rear headrests in the way, over-the-shoulder and straight-back vision above the 8-foot cargo bed is unencumbered. This driver was able to back the Titan down his house-hugging driveway easier than in some small cars. Seats in the S are nicely padded but lack much side support, and have no lumbar adjustment. The wide center armrest flips up to expose a middle seating position, but this would be in emergencies at best. Shoulder room for three, especially in heavy coats, would be tight, and the center passenger would be riding knees-up with feet resting on the wide transmission tunnel. The two outboard seating positions enjoy good legroom and enough headroom to accommodate even fairly tall occupants. Step-in is somewhat high without the aid of accessory step rails. Large analog dials serve as the speedometer and tachometer. A vehicle-information display projects between them but can be hard to read with polarized sunglasses. The radio is simple to tune, and presets are quickly stored on the 5-inch touchscreen. Handy dials set temperature and fan speed for the climate system, with just a few well-marked buttons for other functions. A rotating dial selects 2- or 4-wheel drive. It’s located low on the instrument panel to the driver’s right, and is easy to reach and work. The center armrest opens to reveal an organizer for numerous small items. A larger organizer is provided for the space behind the seat. Two cup holders are molded into the armrest, but in the event that it is flipped up, additional cup holders fold out of the center of the dash near floor level. Other cabin storage comes from a large glove box and door pockets with twin bottle holders in each. Twin power points and a USB connection are set into the lower part of the dash. Hustling along at expressway speeds, ride quality was pretty good for an empty truck with a leaf-spring rear suspension, though perhaps not the best overall in the large-pickup class. Any tendency to hop was well controlled. Necessary steering effort was moderate, which aided maneuverability, and stopping power from the 4-wheel disc brakes raised no worries. Most pickup buyers won’t want such an austere experience as presented by the Titan S. Stepping up a notch to the SV already brings a number of the appearance and convenience items that anybody who isn’t a strictly commercial truck user will likely want. However, pleasing on-road performance and a substantial warranty—5 years or 100,000 miles, bumper to bumper—are incentives to give any ½-ton Titan a look. The Titan S SC comes standard with 18-inch styled steel wheels and an 8-foot-long bed. Written by: The Daily Drive staff on October 6, 2017.